Spike Lee has met controversy recently because of the name of his upcoming film on violence in Chicago, Chiraq. 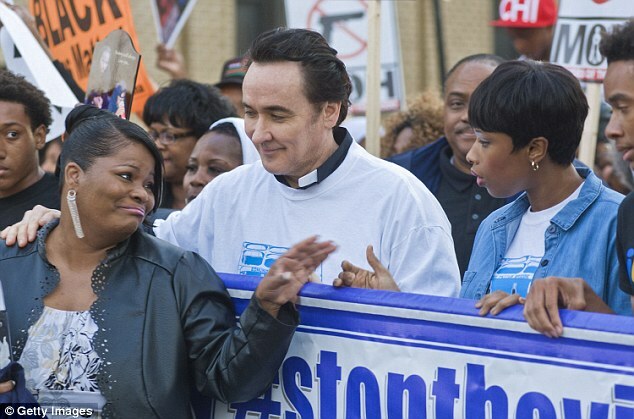 However, on Friday the 58-year-old director had a warm reception from citizens as he was joined by the film’s stars John Cusack, 48, and Jennifer Hudson, 33, for the annual end of the school year peace march of St. Sabina Church. 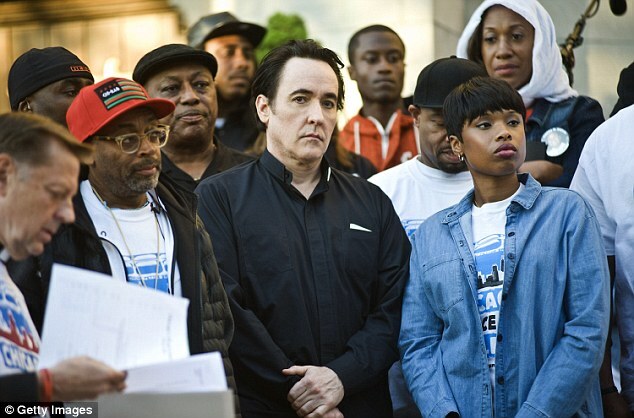 The actors addressed the crowd, urging for peace in the city ahead of the march, where they also filmed scenes for the upcoming picture. 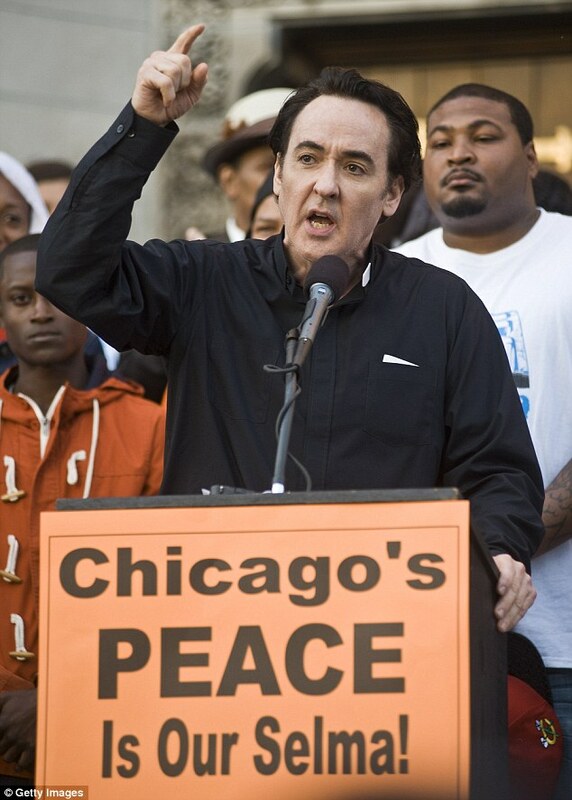 John – also a Chicago native – then addressed the crowd, calling all of the event’s attendees prophets for working towards peace. ‘A Jesuit priest once said a prophet is someone who tells the truth, walks the walk, and pays up,’ he said. John and Jennifer sported white and blue T-shirts displaying their messages of peace during the march, which the latter partly covered with a stylish denim button down. 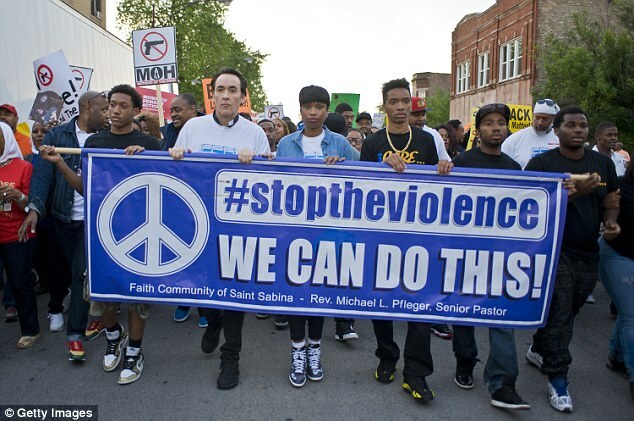 The pair also held onto a purple banner as they walked, which read: ‘#stoptheviolence WE CAN DO THIS!’ along with a peace sign and the name of the pastor of the Faith Community of Saint Sabrina, Rev. Michael L. Pfleger. 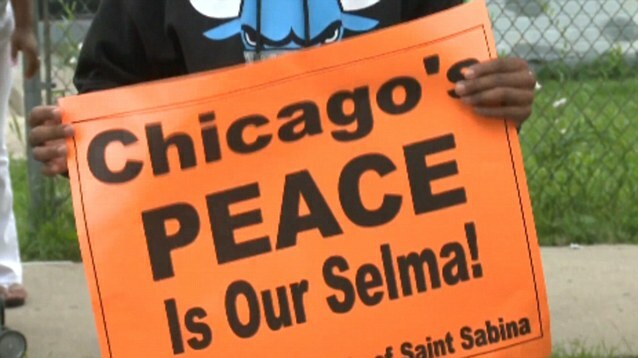 John and Jennifer were also seen chatting with the Pastor at the peace rally, as well as citizens of Chicago. Lee has recently been met with criticism for the title of his star-studded film, Chiraq, which is a combination of the names of Chicago and violence-torn Iraq, and pronounced (shy-RAK’). ‘This is real life and death and that’s the way we’re going to approach this,’ the Oscar nominated director continued. Mayor Rahm Emanuel is one such critic of the upcoming movie, saying he thought it unfair to the residents of the Englewood neighborhood where the film takes place. One member of the city council has pushed for the city to deny Lee’s company a multimillion dollar tax break for shooting the film unless he changes the title. Pfleger, who continues to support Lee and the use of ‘Chiraq,’ pointed to the ongoing violence as a reason why Lee should do the film. Chiraq also stars Samuel L. Jackson, Common, Angela Bassett, and Jeremy Piven, and is slated to hit theaters sometime in 2016.
against chicago Hudson Jennifer streets Take Violence. Previous: Prominent Pastors Join To Address Charleston, Ferguson, Baltimore and more! Next: Chilling Photos Of Residents Of South Carolina Saying Take The Confederate Flag Down!